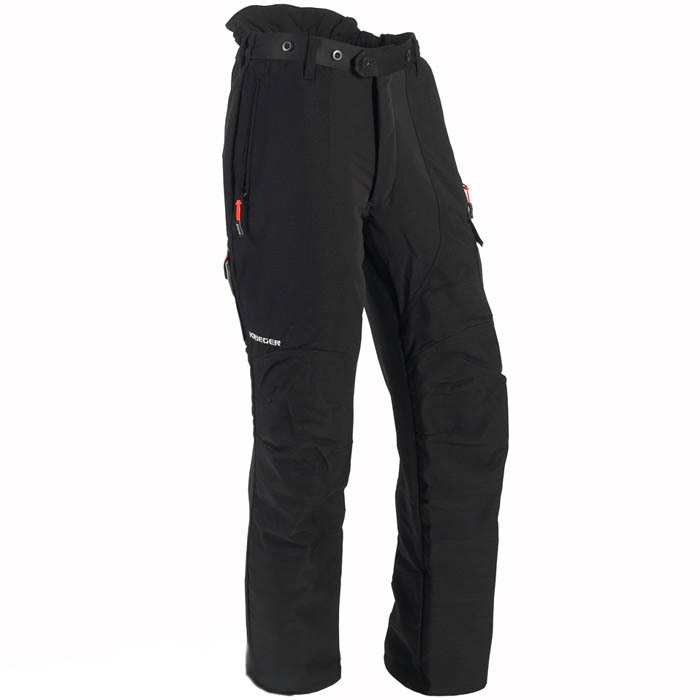 STEIN’s lightweight KRIEGER Arborist chainsaw trousers are over 25% lighter than the original Revolution trousers. The Krieger Arborist trousers are based on a stratified construction system. We have utilised a 4-way stretch Armortex base layer in our trousers, this abrasion resistant material ensures the climber has full flexibility when climbing. We know from industry experience static materials do not work for tree climbers who require ultimate freedom of movement. A roomy tailored leg constructed with minimal seams ensures excellent air circulation reducing the need for un-necessary wear and tear points like leg vents and stitched joints. Zips and crotch stitching have been an issue in arborist trousers. The KRIEGER zip has been double cross stitched and clamped at the base reducing the risk of stress load’s when climbing and the crotch seams are also reinforced stitched. A layer of NOMEX ZMX now protects both thigh areas from accidental exhaust burns and increases the durability of the trouser in this high wear area.ArmortexKFM protects the greave areas from the knee to the foot, this heavy duty waterproof and tear resistant Kevlar polyamide material offers enhanced wear over normal materials with pre-formed knees giving increased comfort and movement. The enhancements are not just on the outside, integration of the latest European light weight technical blocking filaments means the Krieger’s are also extremely light. The blocking filament is protected from boot eyelet wear by a large inner cuff.On the right leg a high visibility phone pocket highlights the 112 European emergency number. A larger formed pocket is fitted on the left leg. Despite our enhancements and increased durability the Krieger trousers are over 25% lighter than the STEIN Revolution trousers. Tested in the UK by SATRA the KRIEGERS are CE Certified to EN381-5 Class 1 (20 m/s). They are available in both front protection (Design A) and all round protection (Design C).